Looking for Custom Control Panels? Get a quote fast. A custom UL 508A control panel solution just for you. As the core of all your motor and lighting controls, your electrical control panel is an important piece of hardware. For more basic control panel solutions, we have a huge selection of panels from industry-leading manufacturers. But for custom projects, you may need a more advanced control panel configuration that can incorporate many different components to create a consolidated automation solution. 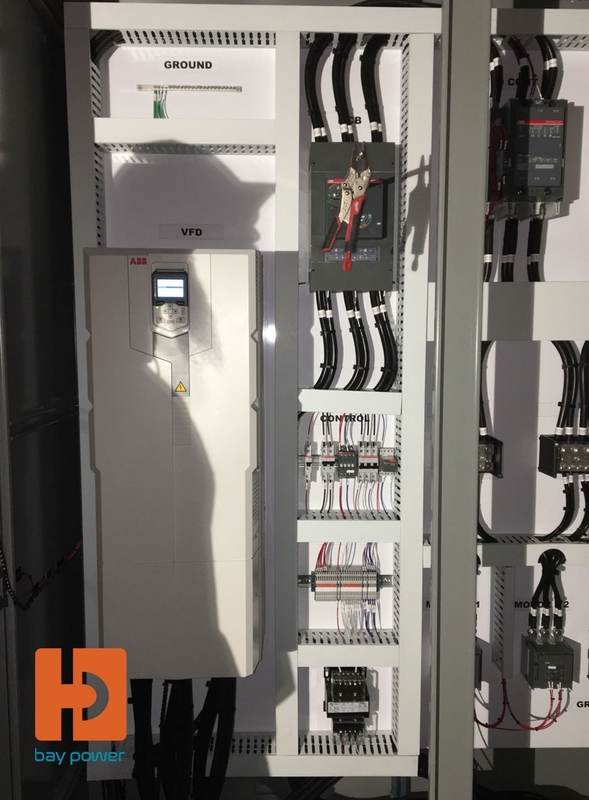 A custom control panel design will give you the freedom and versatility of choosing every component, from the circuit protection and load protection, to the drives, relays and optional NEMA rated enclosures. Our UL 508A certified panel shop can build a custom control panel to your specs. Why Choose a Custom Control Panel? The options and combinations of components inside a control panel are nearly endless, so it can be sometimes be difficult to find a factory panel that meets your specifications exactly, especially when you are getting into larger scale applications. 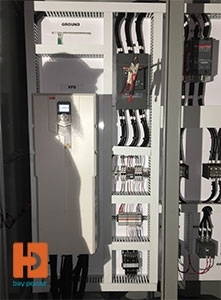 Whether you're looking for a pump control panel, a VFD control panel, or a general industrial control panel for lighting, HVAC, etc, choosing a custom option will provide you with the reassurance and peace of mind that you are working with a control panel design that was built especially for your application with no compromises. Specify the NEMA enclosure type you need, whether it be N1, N3R, N4X, and so on. Talk to one of our panel builders today to plan out your panel. Contact us via the form below or give us a call. Our UL 508A certified panel shop is more than happy to provide custom control panel building services. 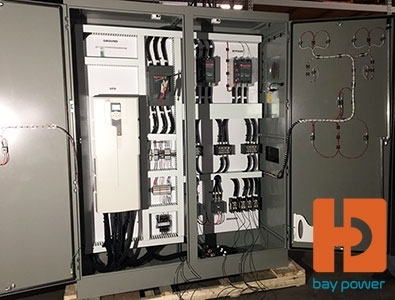 Our custom control panels are built to your exact specifications, in IEC or NEMA styles, are assembled in-house, and shipped to you installation-ready. 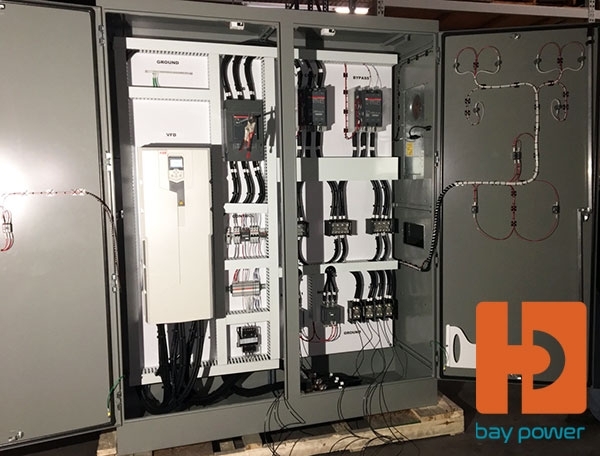 Whether you choose from our selection of pre-established custom control panel options, or you design your own solution, you can count on Bay Power to deliver a reliable, high quality product. Have any old or unused Custom Control Panels lying around? Don’t get rid of them just yet. While we stock a wide range of quality electrical products and solutions, both new and reconditioned, we also buy back your unwanted equipment. So, before deciding what to do with your old Custom Control Panels and components, have one of our expert technicians take a look to see if we can save a few parts, save the environment, and save you some cash. Great service shouldn’t end after the purchase. We pride ourselves on the relationships we build with our customer-first mentality and the quality of our Custom Control Panels and components. That’s why we offer a 1-year replacement warranty on all of our electrical products and solutions from the top manufacturers. Because when you buy with Bay Power, you buy with confidence. We are proud to stock a variety of competitively priced, new and reconditioned components from leading control panel manufacturers, including Blue Box, Schneider Electric, GE, Eaton, Crestron, and more. Thanks to our extensive inventory of control panels and control panel components, our resourceful and expertly trained staff will always be able to get the products that you need. Through our extensive network of suppliers, we are able to carry and acquire a huge variety of components, so chances are if you need it, we can get it. 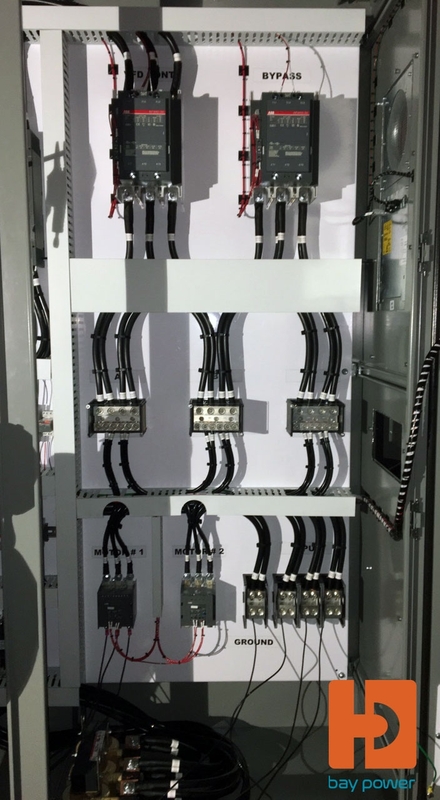 As a UL 508A-certified panel shop, we can also build you the perfect custom pump, lighting, or industrial control panel according to your exact specifications. Bay Power’s priority is providing you with reliable, high quality electrical hardware. That’s why our mission is to make sure our reconditioned panels function as perfectly as the day they were built. Because while the quality is high, the cost of an electrical panel shouldn’t be. Our selection of new surplus control panels may not arrive brand new in a box, but they function just as well, and have never had electricity run through them. All of the quality, none of the packaging, always with our 1-year replacement warranty.